Full company of Student Body. Photo by Hunter Canning. BOTTOM LINE: A relevant and unrelenting play about sexual abuse on a college campus that’s bound to be a conversation starter. It’s a winter night at a small liberal arts college. A storm is about to hit and Sarah has called her friends to a meeting in the school's theatre for some advice. Playwright Frank Winters expertly sets the uneasy scene. 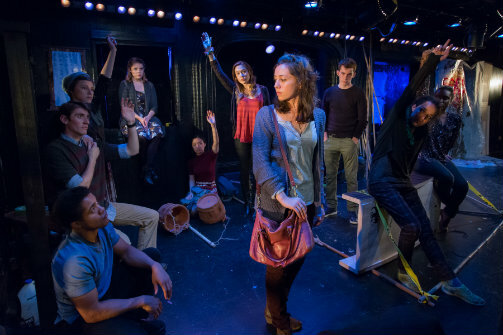 As the co-eds, several with male friends in tow, enter the stage (both the literal one and the one the play is set on), they are quickly recognizable as different types of college students. It’s clear that this is supposed to be a quick stop on the way to their usual weekend celebrations. Their fun banter and drinking games brought me back to a time in my life where a weekend of no classes called for the same festivities. The camaraderie of The Bats, the resident acting company of The Flea, is evident and adds a wonderful authenticity and light energy to the beginning of what promises to be a heavy piece. By the time Sarah arrives, there are more people than she expected, but she decides to let everyone stay so to help with her problem. After the party she had at her parents house last weekend, Sarah found her dad’s camera loaded with crazy pictures and a new video. And it's the video that's the problem: it shows a couple engaging in sexual activities while others watch. Crucially, it’s unclear whether or not the girl is conscious. From this point on, we know the jokes are over and the tension in the room is unlikely to be resolved easily. This subject matter is inarguably relevant right now. With instances of sexual abuse on college campuses coming to the forefront of the media, this play is unsettlingly pertinent. The Bats handle this dense, dramatic material gracefully. Most of the company is fresh out of college, making them perfect archetypes for these characters. Jared Schomer’s scenic design is appropriately rugged and dark. The set (of an unfinished set) uses the small space well, allowing the actors to play with lots of spacial possibilities. Director Michelle Tattenbaum takes good advantage of this by never letting the play become physically stagnant. Red masks, presumably for the upcoming production at the college, provide a haunting visual addition to the theme. Even if it can be established that what's on the video is in fact sexual abuse, this may still not provide the students with an easy solution. It soon comes out that some in the room are peripherally involved, complicating the consequences of bringing the tape to the police. Winters’ script, though dynamic, is not without issues. While he has established some fascinating conflicts that only get more interesting as information is revealed, the dialogue snowballs into a unrelenting argument between characters with little to no respite. At times, the conversation becomes clunky and unfocused. Though perhaps this is suitable for the situation, it makes for a long, one hour play. In the end, Student Body, left me appropriately unsettled. This play is complicated, and the characters are often not sure what they should do. What's interesting is that when watching from an audience’s more removed perspective, the definition of sexual assault, along with what is the "right thing" in such a situation, may well be much clearer. If the main point of this piece is to leave audiences thinking and talking, it is undoubtedly successful.